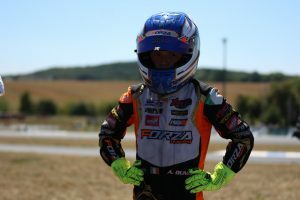 Offaly based teenager Alex Dunne made an impressive start to the 2019 European Karting Championship at the Sarno circuit in southern Italy this weekend, as he took three wins from his four heats, fastest race lap and second in the Pre-Final. Unfortunately for the young Irish racer he was taken out in the final, bringing a premature end to his very positive weekend. Friday’s qualifying saw Alex right on the pace as he continued to get used to his new Tony Kart team. On only his second event with the Italian outfit he finished fastest in Group 1 with second quickest time overall, to put him on the front row of the grid for all of his heats. Friday’s first race saw the Clonbullogue resident start from pole and he was never headed as won by almost a second. For race two Alex sat second on the grid, behind the fastest driver from qualifying. Away from the lights the Irish driver was comfortable in second place and stayed there until lap three when he moved past to take a lead he would hold onto until the chequered flag. Heat three saw Alex again leading from lights to flag, this time building up a huge winning margin by Karting standards of 2.5 seconds. Alex also initially led the fourth heat but on lap four he was overtaken for the first time all weekend and dropped to third. The Tony Kart driver was soon back to second and fighting for the top spot but a small mistake on lap eight, while right on the tail of the leader, saw him run off the track and drop to twentieth at the flag. Dunne’s heat four finish meant a third row start for the Pre-Final. Once the lights changed to green the teenager once again showed his ability as he battled back to second by the flag to line up fourth for the final. The final started well, with Alex running strongly at the tail of the lead group. As the leaders battled, the field began to close and Alex was caught by the leader of the chasing pack, who on closing the gap, immediately attempted an impossible overtaking manoeuvre, knocking the Irish driver out of the final. Despite failing to finish the final Alex Dunne left the European Championship opener with his best ever position in the standings, as his points from the Heats and Pre-Final were enough to leave him seventh overall. Next up for the youngster is the CIK European Championship opening round at Angerville, France, on April 18th – 21st. 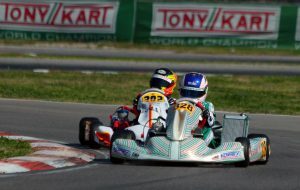 Alex is contesting the four round WSK Super Masters Series in Italy during February and March. This weekend its Round 2 at Garda. 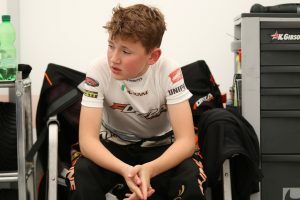 Alex will race in the OK Junior category as part of the build up to the 2019 European Championship. The event can be followed on the WSK Live Timing which can be accessed at www.wskarting.it/livetiming. Sunday’s finals will be live streamed on the Championship web site LIVESTREAM. All of the results will be posted shortly after each race on www.wskarting.it/results. 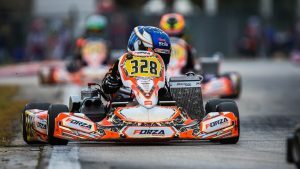 Racing in the Winter Cup in Garda, Italy, rising Irish Karting Star Alex Dunne had another very positive weekend as he builds towards his second season in the European Karting Championship. Having shown excellent pace throughout the event the teenager left the track with renewed confidence, despite failing to finish the final, where he was knocked out of the race while challenging for a podium position. The Dublin born teenager who now lives in County Offaly had one of his strongest weekends of his Karting career so far, as he qualified on the front row of the grid for his four heats. Racing in a very competitive field, Alex started steadily in each of the qualifying races before battling his way up to second place in the first three races and then hitting the top spot in the final heat. The Newbridge college students’ performances in the heats left him second of the almost ninety drivers taking part, giving him pole position for Super Heat two, the results of which would be added to the heat results to decide the final grid. Alex’s Super Heat started well, as he led the opening couple of laps, but it soon became obvious that he was struggling as he was constantly defending his position. Eventually the pressure told and one by one his rivals found a way past as he dropped to tenth place due to a down on power engine. With a new motor installed for the final, Alex was looking strong again and was in the thick of the lead battle straight away. Initially up to fourth, the Clonbullogue youngster was pushed back to fifth on lap two but remained firmly in contention. As he lined up a move back to fourth place at the end of lap three, a coming together between the two drivers in front of him saw one spin across the road into his path, taking Alex out of the race. The weekend of February 14th – 17th see Alex racing in the 24th Winter Cup in South Garda, Italy. Alex will race in the OK Junior category in this one-off event. The event can be followed on the Winter Cup Live Timing which can be accessed at apex-timing.com/livetiming. Sunday’s finals will be live streamed on the circuits web site southgardakarting.it/live-streaming. All of the results will be posted shortly after each race on www.southgardakarting.it. 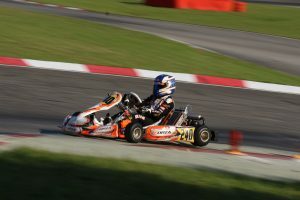 The opening round of the WSK Super Masters Series, at Adria in Italy, was a tough one for Irish Karting star Alex Dunne. Having been fastest in pre-event testing, his race weekend was almost ruined by mechanical issues and contact from his rivals, before a brilliant recovery drive nabbed him eighteenth place in the final. Qualifying took place in the wet, meaning a change of Kart, and Alex was not as happy with the wet weather chassis as he had been with his normal one, leading to seventh fastest time for the Offaly teenager. The opening heat also took place on a wet but drying track and Alex performed well in the difficult conditions to climb as high as fourth before eventually finishing fifth. Similar conditions in heat two saw Alex again run as high as fourth, but towards the end of the heat he began to struggle for pace and dropped down to eighth at the flag. Alex’s drop off in performance was later explained when the team found that his chassis had broken, meaning a quick repair was required before the third heat. Heat three was the turning point of the weekend for the Offaly racer as a non-finish, caused by being rammed from behind, interrupted his string of competitive performances and damaged his chances of a good starting position in the pre-final. The heat three non-finish meant Alex went into the final heat with an untried set -up on his Kart and despite initially making progress he once again dropped down the order as he adapted to the different feel of his chassis, eventually finishing fourteenth. When the heat results were combined the Irish youngster was left in thirtieth place and with a lot of work to do from the eighth row of the grid in the pre-final. With his Kart now adapted to the conditions, a strong performance in the pre-final moved Alex up the order to ninth putting him safely into the all important final. The last race of the weekend was the most competitive of all for the Clonbullogue native. A steady start was ruined on lap four when contact from behind put him off the road and down to twenty third position. A brilliant recovery drive, which included sixth fastest race lap, moved him back to thirteenth place on the road but a penalty for non conforming bodywork, caused by being hit from behind, dropped to eighteenth at the flag. Alex will be back in action in a non-championship race at Lake Garda in two weeks, before returning to Adria for round two of the WSK Super Masters Series the following weekend. To keep track of Alex’s progress see his web site www.alexdunneracing.com where you can find links to live streams and results from all of his races. 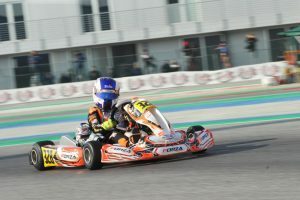 Alex is contesting the four round WSK Super Masters Series in Italy during February and March. Starting this weekend at the Adria International Raceway.